Vancouver BC (August 22, 2017)– Cause We Care Foundation is proud to announce its new charitable campaign: Clean Out Your Closet for a Cause. Throughout September, Cause We Care is working with retail and media partners to promote clothing consignment to support single mothers and their children in need. 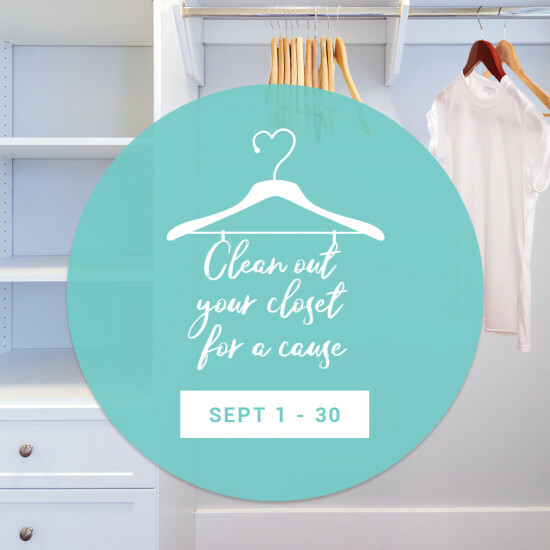 September’s Clean Out Your Closetfor a Cause month encourages Vancouverites to host a consignment party or bring their gently used women’s clothing, shoes and accessories to any Turnaboutlocation in the city (West Broadway, 4th Avenue, South Granville or Main Street). Proceeds from the items donated to the Cause We Care Foundation account will go directly to the charity when they are sold. Individuals interested in hosting a consignment party can register through the Cause We Care website (www.causewecare.org). Proceeds from the sale of items will go towards community development initiatives, including affordable housing, employment training and afterschool care programs for women-led families in need. Cause We Care would like to extend an enormous thank you to the campaign’s invaluable retail partners, including Turnabout, Bacci, Aritzia, Blue Ruby, Hills and Hills Dry Goods. Consignment stories and photos can be shared using the hashtag #singlemotherstrong and #ConsignmentForACause. For more information on the Clean Out Your Closet for a Cause campaign, please visit http://www.causewecare.org/closet.